Butterfly bush need full sun. When we say full sun, we mean it – butterfly bush require a minimum of 8 hours of bright sunlight. Even in warm climates, plant them where they get no fewer than 6 hours of sun. Butterfly bush need perfect drainage. Their roots are sensitive to rotting, and if they spend any amount of time in wet soil, they can be set back or even die. Most of the time, if you lose a butterfly bush after winter, it wasn’t due to low temperatures or snow or ice – it was because the plant sat in cold, wet soil in fall or spring. Never amend the soil. Don’t add top soil, potting soil, compost or anything at planting time. Plant directly into your natural soil. This is true for all shrubs, but is even more important with butterfly bush, as amending any soil, and particularly clay soil, can cause drainage problems. Plant “high” – instead of positioning the plant even with the ground level like you would other plants, dig a slightly shallower hole (yep, that means less work!) and position it so that the base of the plant is a bit higher than the ground. This creates a small “hill” that encourages water to drain away from the plant rather than settle around it. 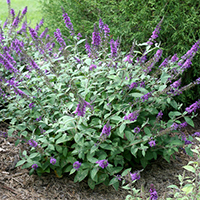 Avoid mulching directly around your butterfly bush. Mulch is a great idea for other species of plants, but in clay soil, it can hold too much moisture. Go ahead and mulch your beds, but give your butterfly bush a bit of clearance, and never mulch all the way up to the main stems. Prune in spring, after the new growth emerges. 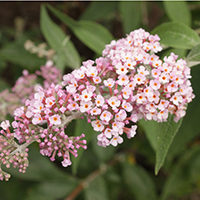 Many people cut their butterfly bush back in autumn, as part of their fall clean up. But particularly in cold climates, this can leave your butterfly bush more susceptible to damage over winter. Do not prune until you see green buds on the stems. Make your cuts just above where big, healthy leaf buds have formed. It can take several weeks into spring for new growth to show up - be patient and resist the urge to cut them back too early. But do prune your butterfly bush. Left unpruned, large butterfly bushes can become “second story” plants: their flowers form way up at the top so you can’t enjoy them unless you have a second story window. The warmer your climate, the more you should cut back your butterfly bush each spring. Even dwarf varieties like our Lo & Behold® series still need pruning – you’ll just be cutting back less than you would on a variety that reaches 8’ tall. Be patient. 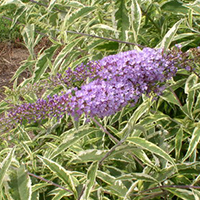 Butterfly bushes tend to be one of the later plants to leaf out in spring. Even if everything else in your landscape is turning green, that doesn’t mean you’ve lost your butterfly bush. Many people recommend waiting til as late as Father’s Day (the third Sunday in June) to be certain their butterfly bush perished. It can be very surprising to see how quickly a butterfly bush can recover, even if it takes that long to come back! Learn more about this phenomenon in our article, Plants that Push the Snooze Button on Spring. Don’t overwater. Particularly if you have clay soil, watch watering carefully. If you have an irrigation system, be sure it’s not inundating your butterfly bush. Signs of overwatering include weak stems, fewer flowers, and dieback. Avoid fall planting. Because butterfly bush may get a bit of winter damage in cold climates, it’s best to give them as long a time as possible to get established before they face the challenges of the cold, wet season. In USDA zones 5 and 6 especially, keep butterfly bush planting time to spring through mid-summer so the plants have ample opportunity to develop a good root system to sustain them through winter. InSpired® series: large and colorful. These are similar to old-fashioned types, but they have very large, showy flowers, good fragrance, and get quite tall (8’/2.4m). Lo & Behold® series: small and mounded. Perfect for flower gardens. Lo & Behold® ‘Purple Haze’ is the largest of this series; Lo & Behold® ‘Pink Micro Chip’ is the smallest. Lo & Behold® ‘Blue Chip Jr.’ is the earliest to bloom of the series. “Miss” series: medium height (4-5’/1.2-1.5m tall), refined, elegant habit, intense colors. The flowers of ‘Miss Molly’ are as close to red as you’ll find in a butterfly bush. ‘Miss Pearl’ offers pure white blooms that look especially magical at night. Pugster® series: short and stocky, with full-sized flowers in saturated colors. The thick stems of our newest series makes these an excellent choice for areas where butterfly bush experience a lot of winter dieback. Pugster Blue® is especially exciting, with its true-blue blooms. ‘Summer Skies’: large and bold. The splashy variegated foliage of this variety makes it eye-catching well before its purple blooms appear in mid-summer. I heard butterfly bush is invasive. Is this true? Butterfly bush has become invasive in some areas, and is on invasive plant watchlists or even banned in some states. This is why we work with renown plant breeder Dr. Dennis Warner of North Carolina State University to introduce seedless and non-invasive varieties, like the Lo & Behold® series and the “Miss” varieties. These plants have been approved for sale in Oregon, where others are banned. 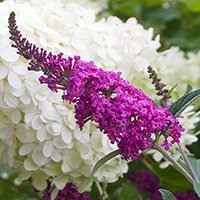 However, in these states, they are sold under the name “summer lilac” instead of “butterfly bush” to clarify that they have been approved by their respective departments of agriculture. So is butterfly bush the same thing as butterfly weed? No. When most people say “butterfly weed,” they are referring to one of several species of milkweed (Asclepias sp. ), an herbaceous plant. Butterfly bush (Buddleia sp.) is a woody plant (shrub). I heard butterfly bush is bad for butterflies. Is this true? Butterfly bush attracts butterflies because its flowers are high in nectar. However, this nectar only sustains the butterflies themselves – it does not provide crucial food sources for caterpillars (which are the larval or “baby” stage of a butterfly’s life cycle). If you want to create a truly butterfly-friendly garden, don’t just plant a butterfly bush - plant a wide variety of trees, shrubs, perennials, and annuals that bloom at different times to provide an ongoing, diverse buffet for the babies and adults alike. Be sure to include plenty of plants that are native to your area – contact your local cooperative extension office for specific recommendations. Do I need to cut the seeds off my butterfly bush? All of our butterfly bush will bloom all summer long without deadheading (the process of removing seed heads). To eliminate the possibility of butterfly bush spreading, you can cut off and dispose of the seedheads left on the plant in autumn - as long as you aren’t doing any major pruning into the plant, it’s perfectly fine to do this. Can I cut my butterfly bush blooms to use in flower arrangements? Yes, but unfortunately, they don’t hold up very well in a vase. If you want to try, cut them early in the morning and place the stems in water immediately after cutting. Can I grow butterfly bush in a container? Yes! Butterfly bush will thrive in containers. Be sure to select a container that has several large drainage holes, and fill the container only with a fast-draining, light-weight potting mix. The container you select should be made out of a weather-proof material that can be left outdoors year-round. Do you sell this in Texas also? Would love to have one!! I hope this helps in your search! Hello! Great information, thank you. I purchased a few miss ruby butterfly bush as they were on sale. I bought them in January and i live in Salt Lake City (Zone 6). They are in four inch pots. My plan has been to keep them in an unheated garage until spring, then plant them in the ground. Does this sound reasonable, or should i consider something else? Thank you! That's probably the best plan for now. Just be sure to set a reminder to water them every 10 days or so...they can still dry out severely. Water sparingly, but do water now and then. Hello there, i have a great Miss Molly in a planter. i need to make sure i'm winterizing it the right way. can you make a few suggestions? I bought some burlap and was going to wrap some insulation around the planter as well and bring it towards the house to help minimize wind damage. Love all your plants every year! always satisfied with them! Hi Lisa - to best answer your question, I'd need to know where you are located. However, in general, I would not recommend wrapping it in burlap - that could hold moisture during cold weather, which is really bad for butterfly bushes. The most important thing you can do for winter survival, both in the ground and in a container, is to make sure the soil doesn't stay too wet when the weather is cold. You can accomplish this by making sure it won't be dripped on by any overhanging trees or eaves of buildings, or that it won't get snow dumping off of a roof. If you'd like to contact us with more information, you can do so here: https://www.provenwinners.com/feedback. 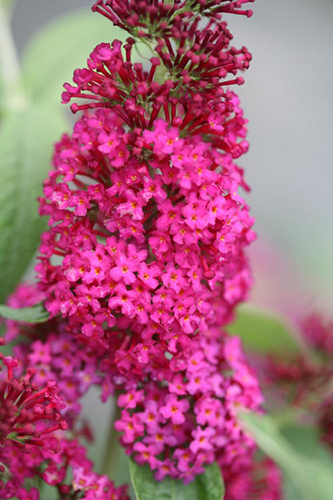 One of your sterile butterfly bushes is described as "Buddleia x Miss Molly Butterfly Bush - Sangria Red". I am aware that the legal cultivar name is `SRPbudsan', but I'm confused about the marketing name. Is it 'Miss Molly' or 'Sangria Red' or what? This matters because while 'Miss Molly' is on the list of cultivars approved for sale in Oregon, 'Sangria Red' and 'SRPbudsan' are not. I'm not sure where you are seeing 'Miss Molly' described as Sangria Red/'SRPbudsan'. 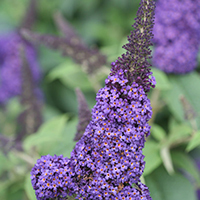 The cultivar for 'Miss Molly' buddleia is simply 'Miss Molly' - it does not have a trade or marketing name. If another website lists it that way, it is in error. I have 2 butterfly bushes that need to be moved. When is the best time to do this? I would recommend doing it in early spring, once the ground is workable in your area. We had 16 days straight of torrential rain and now my beautiful butterfly bush looks like it is dying from the middle. Should I cut back the black stems and hope the rest does not follow? I am not sure what else to do. Go ahead and cut back the dead portions. You may need to consider planting in a new spot as well. Very detailed instructions for care. I learned a lot! Thank you good info. The tip leaves on my plant are curling up with some yellow leaves at base. I am not sure what this could be! Thank you so much for the great and detailed information. I couldn't find anything like this on the web until I came to your article.